It appears that the world's first rigid airship since the 1930s will soon take to the skies for flight trials: and better still, this ship has a new piece of technology which could actually change the existing landscape and permit the leviathans of the skies to return. 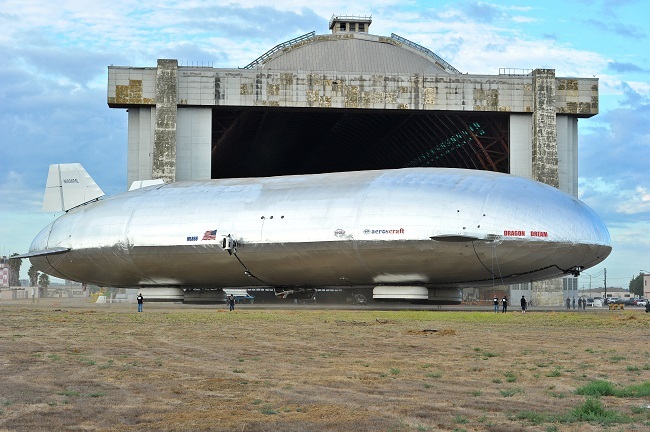 We refer to the Aeroscraft, brainchild of Ukrainian airship visionary Igor Pasternak, and its proprietary Control of Static Heaviness (COSH) tech which apparently lets it do what no other airship has ever been able to. The "Dragon Dream" half-scale demonstrator, which carried out hangar trials earlier this year, has now been certified by the FAA for R&D outdoor trial flights and the first crew to take the ship up has been named. From the Register some time ago. The great advantage of this sort of airship is that it can pump in its helium, and by becoming heavier than air, land vertically. That means it can compete in transportation, at least to remote areas and islands. Also that it can transport units to large for road or rail - the Register article mentions a 600 man battalion with heavy weapons but I am thinking, less extravagantly, of prefabricated houses or nuclear reactors. Latest news is that the testing has been successful and that they expect to have it commercially available by 2016. I wrote previously of how the R100 (the "capitalist airship") and therefore the future of airships was scrapped not because it was a failure but because it was a success which had worked perfectly. The 101 (the British government's "socialist airship") was a failure despite, or because of the ministry's total support whereas the R100 worked fine. This could not be allowed to be understood by the public so the R100 was sold for scrap. Glad to see this technology has only been held up for 80 years by government parasites.